Photo courtesy of PUR Projet. Close your eyes for a moment and try to envision a world without coconut oil. Just kidding! Don’t do that. Nobody wants to imagine a world without our favorite tropical foods—bananas, mangos—gasp—coffee! Wait, chocolate? No thank you. Learning about and purchasing sustainable tropical foods is a great way to ensure people will know the joys of piña colada smoothies and sea salt caramel lattes for generations to come. The tropical (equatorial) parts of our world are the front lines of our defense against climate change—they’re home to the majority of earth’s rainforests. Powered by the sun, enormous, majestic trees breathe in the world’s carbon dioxide, use and store the carbon, then breathe out oxygen. Since slowing climate change depends upon drawing more carbon out of our atmosphere as well as reducing emissions, protecting, managing and restoring rainforests is a vital part of any scenario in which we stop or reverse climate change. Unfortunately, tropical rainforests everywhere are being aggressively cleared to make room for cattle ranching and agricultural products like palm oil and soybeans. This is called deforestation, and it’s commonly done by burning forests to the ground, polluting the atmosphere and undoing the climate benefits of those old-growth trees. Fortunately, there are many people working on alternatives to deforestation as well as ways to repair the damage that has already been done. Fair trade and organic brands as well as non-government organizations and environmental groups are all changing the course of this story for the better—and by voting with our food dollars, we can be a part of that, too. What are sustainable tropical foods? Everything grows well in the tropics—including many annual staple crops we don’t think of as tropical, like corn, wheat, potatoes and soybeans. These crops are extensively grown on deforested land using industrial farming techniques that pollute the air, water and soil. One potential climate change solution identified by Project Drawdown is to convert that type of farming (annual crops) into growing tropical staple crops like palm oil, coconut and avocados which are grown on trees (perennials). These plants store more carbon from the atmosphere, reduce erosion and better utilize rainwater and lend themselves to well to mixed agriculture systems, or agroforestry. Agroforestry is a complicated sounding term for a simple idea—it means having a diverse, vertically integrated farm with fast-growing, tall rainforest timber trees and high-value crops that grow well under their shade, like coffee and chocolate (cacao). Annual ground cover crops like pigeon peas and medicinal herbs round out such a system. 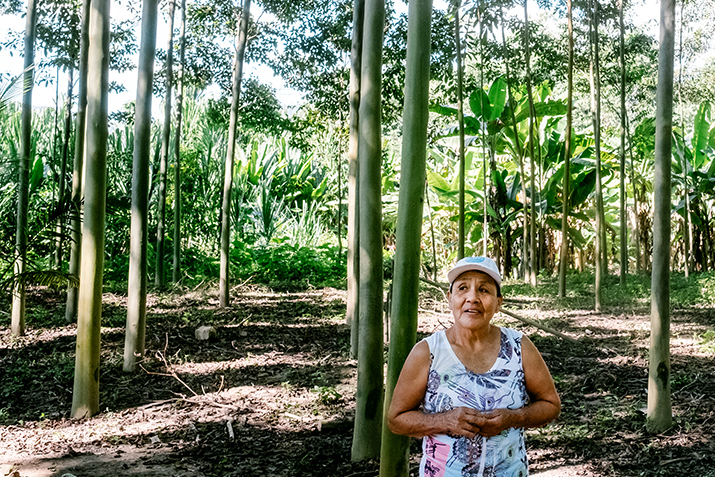 Agroforestry and other farmland restoration efforts are turning around agriculture in the tropics and repairing land ruined by deforestation, making them valuable ways to slow climate change. Food co-ops are directly supporting these cutting-edge climate solutions through Co+op Forest, a carbon offset program. Scientists, agronomists and activists agree that in order to reverse climate change, we need to implement these solutions now. This is why it’s so important to increase consumer demand for sustainable tropical products like palm, coconut and argan oils, fruits like mangos, bananas and avocados, coffee and chocolate. Look for tropical products that are certified organic, fair trade and/or Rainforest Alliance Certified. The rigorous certification standards for these labels include environmental protections and these are the gold standard. Head’s up—and this is important—palm oil is a hidden ingredient in a huge variety of packaged foods, body care products and makeup. In fact, over half of the products in the average U.S. family’s pantry contain palm oil! One of the most beneficial things you can do, as a shopper, is to look for Roundtable on Sustainable Palm Oil (RSPO) certification on products containing palm oil, and visit Palm Done Right to learn more about why and how to identify products that source sustainable palm oil. Food co-ops have provided a market for more sustainable tropical foods for decades now—long before climate change was the widely discussed issue it is today. We’re proud to offer products that are putting these climate solutions into place and we’ll continue to actively seek out and carry more of them as they are available.